There is nothing that feels better than getting a good night’s sleep. Are you someone who doesn’t remember what that feels like? 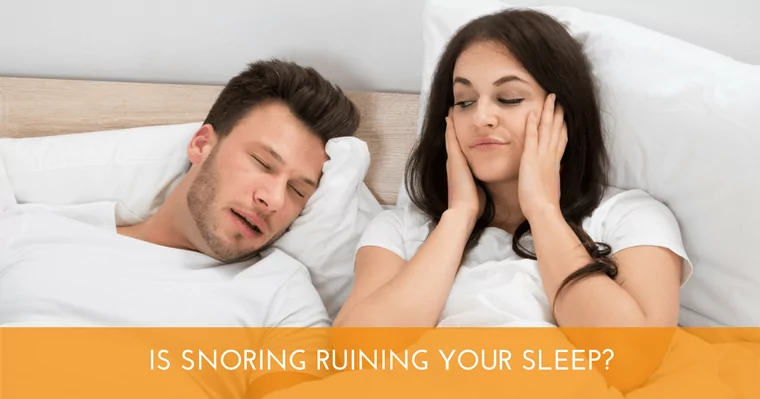 Do you snore or lie next to someone that has a chronic snoring problem? Did you know that someone sharing a bed with a snorer loses on average 1.5 hours per night of sleep lying awake? There is another way! Anyone that snores should have a home sleep study and be evaluated for sleep apnea. Sleep apnea is a condition where an obstruction, or a signal from the brain, is preventing you from taking in air. As a result, the body experiences brief periods where there is lack of oxygen. To be considered apneic the cessation in breathing needs to be 10 seconds or greater. During this time, your oxygen levels in your blood drop and the muscles, tissues, organs are stripped of necessary oxygen-rich blood and a whole host of medical conditions can be caused or worsened. Additionally, we now know that intermittent sleep or disrupted sleep is a promoter of cancer progression and not a healthy condition for anyone. If you are found to have sleep apnea it is a good idea to be thoroughly evaluated by a sleep physician. They will help determine the cause of the apnea and recommend the best remedy for management. You may be thinking, why would a dentist be interested in sleep apnea and be concerned if I have it? That is a good question and the answer is simple. If it is Obstructive Sleep Apnea, dentists can often make a jaw appliance to move the lower jaw slightly forward causing an opening in the airway. This small forward movement may eliminate the obstruction and provide a temporary solution to the apneic condition. Your sleep physician will decide if this is a possibility for you. No matter how you find out you have sleep apnea, it is a valuable finding. In order to be at your best every day you need reparative sleep. We also know that sleep apnea can be a contributor to whole body inflammation. Inflammation is the main driver for heart attacks and strokes. See your Wellness Dentistry Network Member dentist, Dr. Vanama for sleep apnea screening and information about how to manage this deadly condition. Request an appointment today! Your Issaquah family dentist, Dr. Vanama has a keen awareness of how sleep apnea can affect your overall health. As a Wellness Dentistry Network and Kois member, Dr. Vanama performs a very thorough comprehensive sleep apnea examination. Call us at 425- 295-7975 to schedule your sleep apnea examination at your regular exam and cleaning. See our article in the September issue of Connections, a monthly community newspaper published by Issaquah Highlands Council.